Le Suquet is recently converted from an ancient farm building, this renovation has preserved many of the original features of this character building completed to a high standard of comfort and equipment. Set in a quiet location with beautiful countryside views, the many nearby designated foothpaths make it a perfect location for walkers. There are several chateaux and historic towns within easy reach as well as many activities such as prehistoric caves, cycling, canoeing, velo-rail, horse riding/racing, paintball and lake with beach. Newly fitted en-suite shower room with wc, basin and hydro jet therapy shower. Comfortable lounge area comprising of settee, coffee table, English TV, video, DVD and ipod/MP3 speaker docking station. Newly equipped kitchen with induction hob, oven/grill, microwave, dishwasher fridge freezer, coffee maker, juicer, breadmaker, toaster, kettle, iron/ironing board. Notes on accommodation: Smoking permitted on covered terrace. Sorry we do not accept pets. Suitable for babies under 8 months. Outside: French doors leading out onto private paved veranda with secluded outside seating, dining areas, Bose soundlink speaker and BBQ. Private 6.3 x 3.6 metre unoverlooked above ground pool with sunloungers. Cleaning / Towels / Linen / Maid service: All bedlinen and towels are included (except pool towels) and changed on Saturdays. Other: Free use of bicycles. Free wi-fi. This was without doubt the best equippedand comfortable gite we have ever stayed in. It lies in a very peaceful and beautiful location. If you are looking for a peaceful restful holiday this is the place. We were going to do lots of touristy things but the lure of the house,garden and pool was too much! You do need transport although the village is a walkable distance if you are fit. The décor of the house is beautiful, the bed comfy, plenty of storage space, huge selection of kitchen equipment, a big TV ( that we didn't use!) and a wonderful terrace where our evenings were spent . We were there for a rest and Sally and Richard were the perfect hosts....there if you needed them but very respectful of your privacy. We had a wee problem with the wifi not working but that was fixed by the time we left. All in all it is a wonderful place for a holiday and I have no hesitation in recommending it. We were delighted with the property. It was beautifully clean and incredibly well-equipped. Sally and Richard were so friendly and helpful too. It was lovely and secluded and there are some wonderful walks nearby. All in all a perfect venue for a relaxing, comfortable, romantic holiday! Very well equipped gite in a fantastic location. Remote, but a bonus for us. Very friendly owners. We felt at home from the moment we arrived. Recommended: Visit St. Jean de Cole, Brantome. We needed more than the week that we had. Thankyou Sally & Richard. 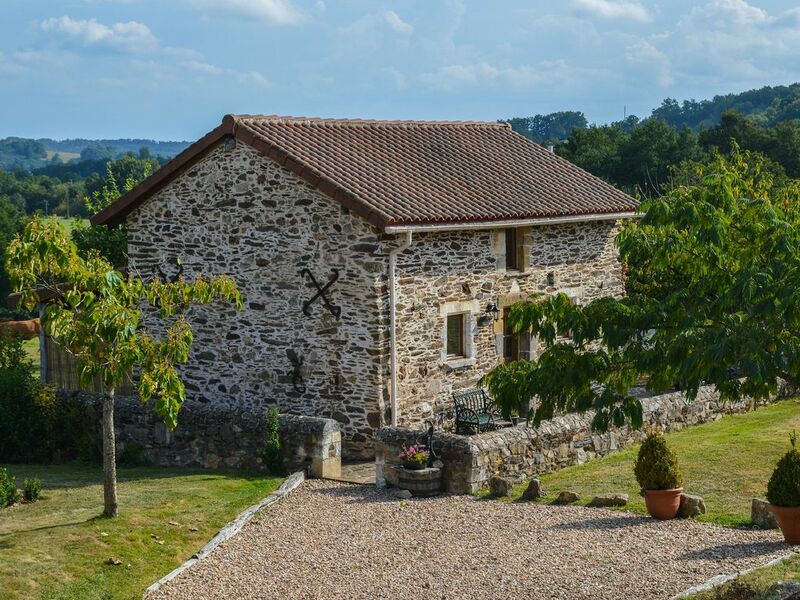 A gem of a 'gite' that is truly private. Lovely stone building, great internally with open plan living area, large bedroom and great large bathroom. Lovely terrace and garden with several places to sit/or lay and while away the hours. Overlooking fields the views are lovely. We made good use of the bikes available. Enjoying the rural hilly surroundings. We included a daily stop off at the local excellent boulangerie/shop in the local village which was of a very high standard. This can be walked to in around 15 mins. The village now has a bar too. We enjoyed time at the gite and immediate surroundings but trips out- Brantome is a must to visit. Canoeing was great fun. Excideuil market was worth a wander we combined it with an afternoon in Perigueux. Sally and Richard were very helpful and friendly during our stay but also respected our privacy. We enjoyed daily visits from the cats and dog. They only hang around if you encourage them- which we did! I made great friends with Puzzle. The animals only added to our stay. Limoges airport is a 60 minute drive away with flights from East Midlands, Liverpool, Stansted, Newcastle, Luton, Bournemouth or Southampton. Bergerac airport is a 90 minute drive away with flights from East Midlands, Stansted, Liverpool, Exeter, Birmingham, Leeds, Bristol or Southampton. Calais is approx. 7 hour drive with frequent ferries and the eurotunnel from Folkestone. St Martin de Fressengeas, with small shop/beautiful bakery and a bar a couple of minutes drive or a nice walk away. Brantome - 20 mins drive, with wonderful market and canoeing, a very pretty town with lots to see. The market town of Thiviers is approx 10kms away and is the capital of the foie-gras region. There are activities and many places of interest nearby.